491. Position. Within the safe inclosure of the floral envelops stand the essential organs - the stamens and pistils, clearly distinguishable from the perianth by their more slight and delicate forms, and from each other by various marks. In the complete flower the androe-cium next succeeds the corolla in the order of position, being the third set, counting from the calyx. 492. A perfect stamen consists of two parts - the filament, corresponding with the petiole of the typical leaf, and the anther, answering to the blade. Within the cells of the anther the pollen is produced, a substance essential to the fertility of the flower. Hence the anther alone is the essential part of the stamen. 493. The filament (filum, a thread) is the stalk supporting the anther at or near its top. It is ordinarily slender and filiform, yet firmly sustaining itself with the anther in position. Sometimes it is capillary and pendulous with its weight, as in the Grasses. 494. The anther is regularly an oblong body at the summit of the filament, composed of two hollow parallel lobes joined to each other and to the filament by the connectile. In front of the connectile, looking toward the pistil, there is usually a furrow; on its back a ridge, and on the face of each lobe a seam, the usual place of dehiscence or opening, all running parallel with the filament and connectile. 495. Attachment of filament to anther. This may occur in three ways. The anther is said to be innate when it stands centrally erect on the top of the fila. ment, adnate when it seems attached to one side of the filament, versatile when connected by a single point in the back to the top of the filament. 497. The facing of the anther is also an important character. It is introrse when the lines of dehiscence look toward the pistil, as in violet; extrorse when they look outward toward the corolla, as in Iris. 498. The connectile is usually a mere prolongation of the filament, terminating, not at the base, but at the top of the anther. If it fall short, the anther will be emarginate. Sometimes it outruns the anther and tips it with a terminal appendage of some sort, as in violet, oleander, Paris. Again, its base may be dilated into spurs, as in two of the stamens of violet. Peculiar forms of stamens. 845, Pyrola rotuidifolia; p, dehiscence by pores at top. 350 Vaccinium uliginosum; p, dehiscence. 847, Berberis aquifolium, anthers opening (346) by valves upward. 348, Anther of Violet, introrse, with an appendage at top. 349, Oleander, sagittate, appendaged. 354, Catalpa, lobes of anther separated. 351, Sage, lobes of anther widely separated, on stipes; b, barren lobe without pollen. 352, Malva, anther 1-celled. 353, Ephedra (after Peyer), anther 4-celled. 501. 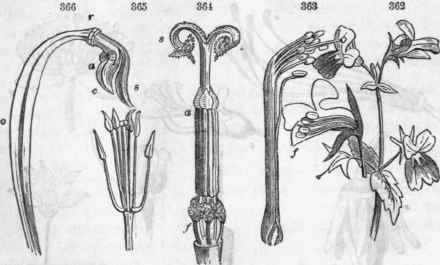 Appendages of many kinds distinguish the stamens of different species. In the Ericaceae there are horns, spurs, tails, queues, etc. In onions and garlic the filament is 2 or 3-forked. bearing the anther on one of the tips. Sometimes a pair of appendages appear at base, as if stipulate. It is often conspicuously clothed with hairs, as in Tradescantia. Essential organs. 355, Rhododendron, five stamens (8), one pistil (p), oblique or slightly irregular. 357, Flower of AEsculus (Buckeye), regular, 5-toothed calyx (c), very irregular 4-pe-taled corolla, seven stamens unequal, one style (8). 359, Flower of Hydrastis; », sepals deciduous. 360, Same, showing the distinct pistils and one stamen remaining. 361, Anemone thalic-troides, the gynoecium of distinct, ribbed achenia. 856, Trillium, six stamens (8), three pistils (p). 358, Stapbylea trifolia. 602. Staminodia, or sterile filaments with abortive anthers or none, occur singly in many of the Figworts and Labiates, or in entire whorls next within the petals, alternating with them, as in loose-strife; in all cases restoring the symmetry of the flowers. They are generally reduced in size, as in Scrophularia, rarely enlarged, as in beardtongue (Pentstemon). 503. The number of the stamens is said to be definite when not exceeding twenty, as is sometimes definitely expressed by such terms as follow, compounded by the Greek numerals, viz., monandrous, having one stamen to each flower; diandrous, with two stamens; pentandrous, with five stamens. If the number exceeds twenty, it is said to be indefinite (denoted thus, ∞ ) or polyandrous. 504. 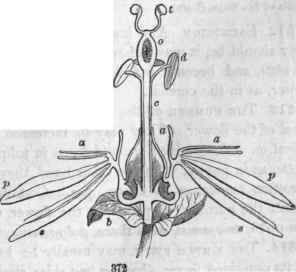 The position or insertion of the stamens (§ 463) may be more definitely stated here, as hypogynous, on the receptacle below the ovaries; perigynous, on the calyx around the ovary; epipetalous, on the corolla, as in Phlox; epigynous, on the ovary at its summit, and gynandrous (yuvή, pistil, avδρες, stamens) on the pistil, that is, when the stamens are adherent to the style, as in Orchis. 505. Inequality in length is definitely marked in two cases, as tetradynamous (τετρaς, four, δvvaµiς, power) when the stamens are six, whereof four are longer than the other two, as in all the Crucifers; didynamous, where the stamens are four, two of them longer than the other two, as in all the Labiates, etc. 362, Collinsia verna:f, a flower enlarged, cut, showing the slightly didynamous stamens, etc 363, Stamens (diadelphous) of a Leguminous plant 364, Stamens (syngenesious) of a Composite; f, filaments distinct; a, anthers united; 8, stigmas revolute, etc. 365, Tetradynamous stamens of a Crucifer. 366, Gynandrous column of Cypripedium; o, ovary; r, torus; 8, sterile stamen; a, two pellinia; c, stigma. 507. 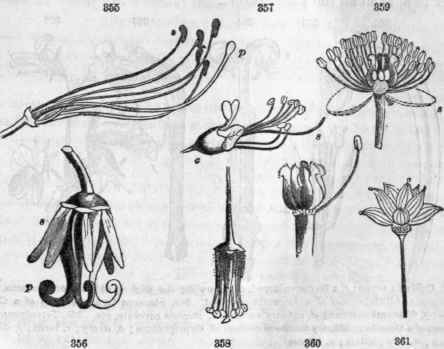 The absence of the stamens altogether, whether by abortion, as in the $ flowers of Veratrum, or by suppression, as in oak, occurs in various modes, rendering the plant monoecious ( 8 ), dioecious ( ♂ ♀ ), or polygamous ( ♂ ♀ ♀ ), as already explained (§ 421). 508. The pollen is in appearance a small, yellow dust, contained in the cells of the anther. 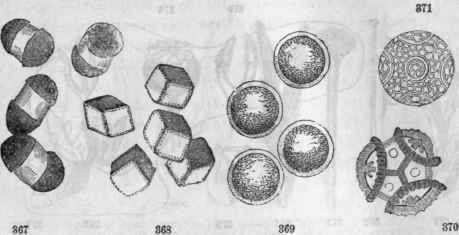 When viewed with the microscope it appears as grains of various forms, usually spheroidal, or oval, sometimes triangular or polyhedral, but always of the same form and appearance in the same species. Externally they are curiously, and often elegantly figured with stripes, bands, dots, checks, etc. Pollen grains. 367, Pinus larico. 369, Basella,' rubra. 369, Ranunculus repens. 370, Scoly-mus grandiflorus. 371, Passiflora incarnata. 509. Each grain of pollen is a membranous cell or sack containing a fluid. Its coat is double, the outer is more thick and firm, exhibiting one or more breaks where the inner coat, which is very thin and expansible, is uncovered. In the fluid are suspended molecules of inconceivable minuteness, said to possess a tremulous motion. When the membrane is exposed to moisture it swells and bursts, discharging its contents. 510. Pollinia. In the Orchids and Silkweed tribe, the pollen grains do not separate as into a dust or powder, but all cohere into masses called pollinia, accompanied by a viscid fluid. 372, Section of the Passion-flower (Passiflora coerulea); 6, bracts of the involucre; 8, sepals; p, petals; a,a, stami nodia or sterile filaments; c, stipe; o, ovary; d, stamens: t, stigmas.